I wanted to share some of the progress I've been making on the EP by releasing an instrumental demo I recorded. The song is titled Insomnia; it's the second song I wrote for my untitled EP. The Digital Audio Workstation (DAW) I used to record the demo is GarageBand. I chose GarageBand because it has a lower barrier of entry than its counterparts, such as Ableton, Pro Tools, or Logic Pro X. It's free to download on Mac, which was a huge plus for me being a happy owner of a MacBook Air. I was surprised by how easy it was to get set up and start recording. The learning curve is pretty small, due to how intuitive the software is. This made it easy to focus on the music, rather than learning recording techniques and DAW features. I run my guitar into my pedalboard consisting of nine distinct guitar pedals which cover a diverse range of sound. From my pedalboard, the signal chain goes into my iRig analog guitar interface adapter, which plugs into my MacBook Air. 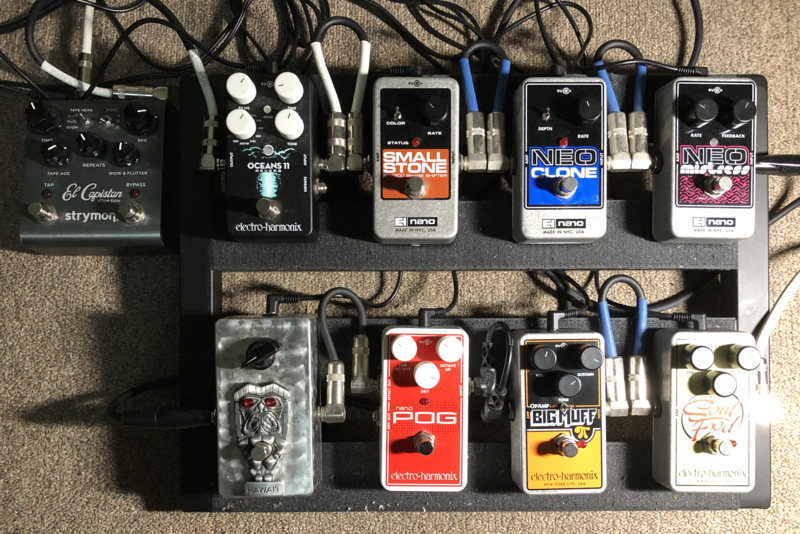 From bottom right to left I have an Electro Harmonix (EHX) Soul Food overdrive, an emulation of the fabled Klon Centaur, the EHX Op-Amp Big Muff for killer Siamese Dream fuzz tones, an EHX Nano Polyphonic Octave Generator, and a Uni-Vibe pedal. The top rack of pedals consists mostly of modulation effects, including a flanger, chorus, and phase shift pedal. Other pedals of note are the Strymon El Capistan, which I use as a tape delay on the recording, and an EHX Oceans 11, which has eleven distinct reverb and echo settings. I used my Fender Stratocaster to record all parts (except for the drummer tracks). For the final production I'll want to record the bass parts on a Precision Bass, but for the demo, I did a quick and dirty recording on my Stratocaster and fudged with the frequencies to make it sound like a bass. In 2019 I traded my gold head of hair for a gold guitar… Not a bad deal. I conceptualized this song as a bare-bones acoustic piece with some tape delay to create a bit of ambience. The song evolved into something more, largely thanks to how easy it is to integrate drums and bass with GarageBand's features. The song was written in the key of A major, with an A Mixolydian guitar solo to finish out the song. The chords I used are augmented to keep the bottom two strings open. It adds tension, atmosphere, and keeps the progressions from sounding too bland. I ripped this off from Alex Lifeson (Rush) and Billy Corgan (The Smashing Pumpkins) who I assume ripped it off from Alex Lifeson - both of whom integrate open-string chording into some of their progressions. More specifically, I'm using the A(add9) as my I chord, a D/A as the verse variation of the IV chord, D 6/9 as the chorus variation of the IV chord, the Bsus4 as my ii chord, the F#m7(11) as my vi chord, and the E/A as my V chord. The song opens up with two guitars over an electronic drum machine track, which sounds similar to a Roland CR-78. The progression for the introduction is dead simple - just a I I IV IV progression repeated twice for eight bars total. The two guitar tracks include the main melody and an accompanying harmonic melody. For the main melody I picked through the A(add9) I and D/A IV chords letting each note ring through. I slapped on a tape delay with the flutter and feedback settings cranked up to create a warble-y degradation, reminiscent of an aging analog tape machine used in the 50s. The opening guitar lick continues over the intro progression as the bass and other accompanying guitars enter the mix. 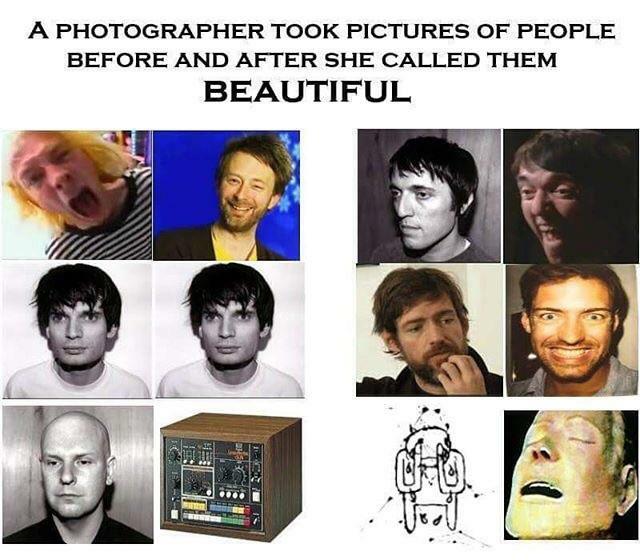 One of my favorite tunes by Radiohead titled "Separator" off their 2011 album The King of Limbs has a guitar tremolo melody with a reverse delay effect used in the Live From The Basement sessions. I wanted to emulate this effect in one of my songs. The reverse delay pans out from the left and continues for the remainder of the verse in addition to the other two guitar melodies. Eight bars into the verse the chord progression changes from the alternating I I IV IV progression to a V IV I I progression for another eight bars before transitioning into the first chorus. The chorus offers the first real progression variation by switching to a ii IV vi V progression, picked open like the intro and verse. There's an accompanying melody in the distant left pan played on the guitar which is barely audible. I EQed out the highs for this accompanying melody to make it harder to distinguish, which adds a little bit of tension to an admittedly bland chorus (without the vocal melody). In the final take, I may add some synths, strings, or continue the reverse delay tremolo guitar to make the chorus more musically distinct from the verse. The chorus continues for twenty measures. On the last iteration of the progression, the chorus finally resolves on the tonic with a ii IV I I, giving the listener the resolution the chorus lacked. After the conclusion of the chorus, the electronic drums play isolated for two measures before the acoustic drum kit picks up, propelling into the second verse with a brief drum fill. The second verse is very similar to the first verse with a few exceptions. The same reverse-delay guitar tremolo melody and harmonic melody are played over the same I I IV IV, V IV I I progressions. All of the variations from the first verse happens with the percussive instruments. The acoustic drums play a different beat than the electronic drums; I also added more fills on the electronic drums to generate more rhythmic variation - to keep things interesting. The bridge follows an augmented version of the verse chords. Instead of following a I I IV IV progression for the first eight bars, and then a V IV I I progression for the next eight, the bridge goes from the tonic I for two measures before following a V IV I I progression for eight bars, building up to the distorted climax of the song. Throwing this in at the end was a bit of a #YOLO to be honest. I'm not convinced it fits the vibe I was going for, so it might not make the final cut. I improvised over two chord progressions joined together by a brief drum fill to create a loud, sloppy flurry of notes. The first progression is modified off of the verse progression following a I V IV I pattern. The second progression, modified from the chorus, follows the ii IV vi V pattern, but plays each chord for an extra measure. The bass drones on at an eighth note rhythm, sticking mostly to the root note of each respective chord to project the solo forward, and not distract from the guitar. I split the guitar solo take into three tracks so I could play with the panning of the solo; I also added a flanger to the third guitar track to add movement to the piece, giving a sense of urgency as the track reaches its conclusion. If I was to record a guitar solo for the final take, I'd write some melody lines as a response to the vocal melody and incorporate them into the shred to give the solo more emotion, and to call back to the main hooks of the song. GarageBand has some limitations. As a DAW, it's great for demoing purposes, but I wouldn't recommend it for professional recording (not that I'm experienced enough to recommend lol). I'm currently looking into alternative DAWs to record my production takes. Logic Pro X seems to be the most logical choice (pun intended) given that I have a Mac, and it has a similar interface to GarageBand. However, I want to try out Ableton and Pro Tools so I make an informed decision when upgrading my DAW. I don't have a microphone to record vocals with me at the moment. I'd like to invest in a good recording microphone to record my vocals, and tenor saxophone. One thing I'd like to incorporate into my songs are some good synth hooks. I've recently been listening to a lot of Depeche Mode, and I'd like to go for a synth-pop vibe in some of my songs. Admittedly, I'm not the greatest at production; after listening to the track a number of times since uploading it, there are lots of places where I could have done a better job mixing/EQing the track. As of now, I have two songs written fully (chord progressions, lyrics, hooks). I'm in the process of writing four other songs which would put me at six total for my debut EP. I'm hoping to record demos for all six songs by the end of July, which may prove to be challenging given school and tentative travel plans. Thank you for taking the time to read/listen! Stay tuned (pun intended) for my debut EP (hopefully) dropping by the end of this year!